How does this relate to you, TGS, or our world? 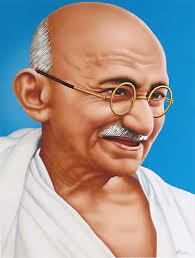 Gandhi Jayanti is a worldwide celebration of the birth of India’s “Great Soul” Mohandas K. Gandhi. This is not only an Indian holiday, as it is also observed by the United Nations as The International Day of Non-Violence; the aim of the holiday is to disseminate Gandhi’s philosophy, principles and belief in non-violence through proper education and public awareness. Born on October 2, 1869, Mohandas Gandhi was a devotee of ahimsa (non-violence) and satyagraha, and he played a crucial role in the movement for Indian independence. Gandhi is known the world over for his philosophy and practice of ahimsa, but it is important to understand that his ideal of satyagraha is much more than non-violence. Satyagraha roughly translates to “the force that is generated through adherence to truth.” It is about the constant yearning for the truth to play out; asking the right questions, being ready to bear the burden of the answers you receive, and having the will to continue asking more. If you would like to investigate further the difference between non-violence and satyagraha, you can click here. Today is a celebration of Gandhi’s principles and ideologies, and as members of THINK Global School I would hope that we can investigate and discuss how we, as the leaders of tomorrow, can implement and build upon Gandhi’s ideals. Is non-violence possible today? Would it be effective? Is satyagraha possible today? Would it be effective? I think that in my own country of the United States our government is too quick to move toward violent action, or at least to make the threat of violent force. It seems daily that we are threatening other countries instead of using diplomacy as a means. We are very quick to judge, and very quick to act without devoting enough time to uncover the truth about what is happening both inside and outside our own borders, I presume. The US could use a good lesson on satyagraha if it plans to continue its role in world affairs. With the world in such an array of violent upheavals and injustices carried out by governments, it seems that Gandhi’s philosophy of satyagraha may still be applicable. There is no doubt that satyagraha is a long and time-consuming process. While the efforts and sacrifices of individuals practicing satyagraha may be futile in their own lifetime, there is hope to evoke change for future generations. Satyagraha causes less damage to people and property than a violent upheaval and does not leave a trace of hatred and ill-will, which unfortunately is developing in the wake of the Arab Spring. There is still bad blood in the air that people are not so quick to forget. Violent upheavals created a powerful vacuum in these countries, and that vacuum is now being filled with one-sided leaders and their clear agendas. The recent trial and conviction for murder of Egypt’s first civilian president, Mohammed Morsi, surely speaks to this. Ultimately, Gandhi’s followers would believe that through ahimsa and satyagraha they would always be victorious because it is the pursuit of truth and truth alone that always wins. I wouldn’t go so far as to be on the ground in Egypt or Syria today preaching the ideals of Gandhi, out of fear that it would conclude with the murder of a large group of potential intellectual leaders. While Gandhi is no doubt, an amazing man, human and great soul, I think his philosophy has become a bit of an ideal to strive for, rather than a plan for action. Indifference and apathy plague our society, and the watchful eyes of the world that shamed the British into leaving India and provided the crutch that made Gandhi’s plan work may no longer be available.